Throughout Appalachia, roadways, trails and mountainsides are dotted with rocky outcrops that are as distinctive to the region as the rhododendron and mountain laurel that surround them. While many people may think that these rocks would be fun to climb, few have the skill to actually do it. For decades, these rocky formations have attracted the attention of those that do. Three styles of climbing are particularly popular in the highlands. The first is bouldering, in which a climber remains relatively near the ground while traversing established routes using no more equipment than their climbing shoes and a bag of chalk. And because the climber is rarely more than 18 feet off the ground, no ropes or safety harnesses are used. Instead, a landing pad and spotters protect against injury in the event of a fall. The other two styles dominate in areas with cliff faces rather than boulder fields. In both, climbers use rope and safety harnesses secured to anchors positioned in the rock along the route, which protects them from falling to the ground. In sport climbing, the anchors are permanently fixed, and in traditional climbing, climbers place their own anchors as they climb. 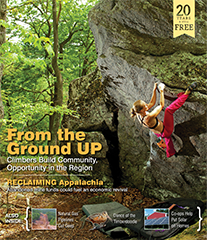 Appalachia offers climbers challenging routes in beautiful settings, and the region’s geology invites climbers of all styles and abilities. And in return, the sport of climbing provides an opportunity for economic development for areas around these rock formations. 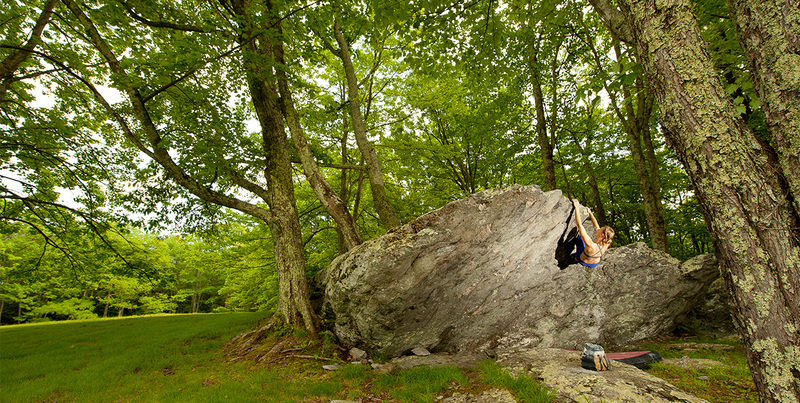 At Grayson Highlands State Park, located in Grayson County in Southwest Virginia, climbers have access to over 1,000 established boulder routes and work in partnership with the park’s rangers and staff to maintain the area. In large part, this is the result of one man’s hard work and love of climbing. 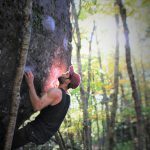 Aaron Parlier now lives in Boone, N.C., where he co-founded the Center 45 Climbing and Fitness gym, but he is a native of Southwest Virginia who spent years collaborating with park rangers and staff to develop the boulder fields of Grayson Highlands into a popular destination for climbers. As a young child, Parlier was introduced to climbing by his uncle, and his love of the sport was so strong that he built a small climbing wall in Afghanistan while serving with the U.S. Army — the wall was later destroyed by Taliban forces. After his deployment, he returned to Appalachia eager to get back outside and climb on rocks. Grayson Highlands quickly drew his attention because it had so many large boulders that no one seemed to be climbing. As Parlier explored the park’s rock formations, his uncle again provided encouragement, prompting him to keep records of the routes he climbed. Several years later, that bit of encouragement developed into Parlier’s published guidebook of 349 climbs at Grayson Highlands. But more than documenting existing climbs, Parlier also worked to establish new routes and to design and build trails that sustainably provided access to them. This work was done during the three summers he served with the AmeriCorps State Park Interpretive Program. Parlier has also studied plants and geology in order to be a responsible steward of the areas where he develops climbs. So, when an endangered flower, the Roan Mountain bluet, was unexpectedly discovered on a single rock face at Grayson, that boulder was immediately closed to climbers. Through his collaboration with park staff, Parlier was able to expand access for climbers, while limiting their environmental impact on the park by only designating routes where no fragile species would be affected and by building and maintaining access trails. 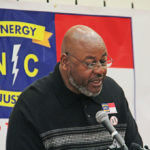 Each Memorial Day weekend he organizes volunteers to maintain the trails he designed. 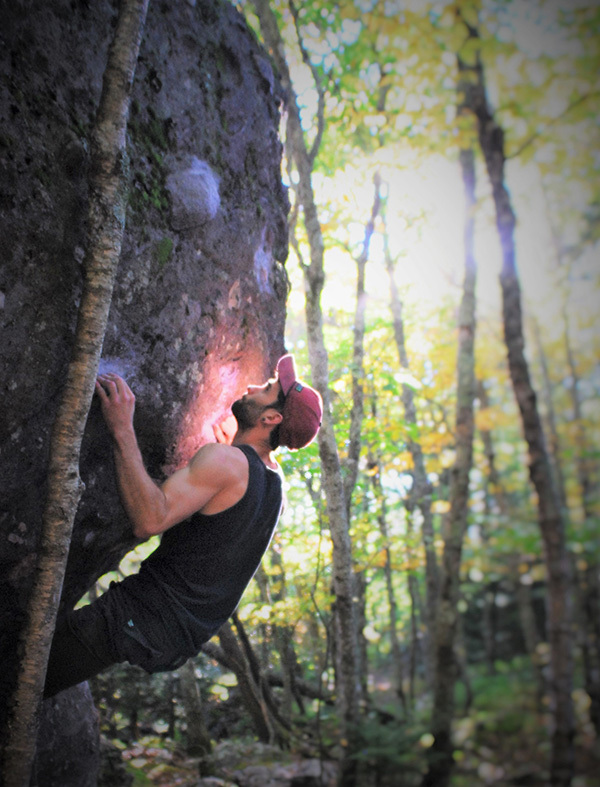 Now, Grayson Highlands regularly attracts climbers from across the nation, and it is increasingly popular with international climbers, too. 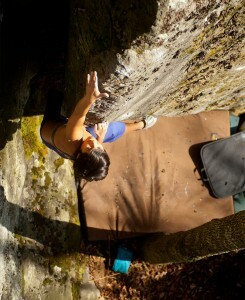 Another popular climbing destination is the Red River Gorge, located near Slade in eastern Kentucky. Nestled in the Daniel Boone National Forest, this area is best known for its majestic cliff faces, which attract rope climbers. A few bouldering routes can be found there as well. 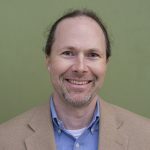 According to an Eastern Kentucky University study released in March, climbers visiting the Red River Gorge contribute $3.6 million annually to the economies of the six Kentucky counties along this geologic feature — Estill, Lee, Menifee, Owsley, Powell and Wolfe counties, some of which are among the poorest in the country. The town of Norton, Va., is also poised to expand its economic base by attracting climbers to the region. A strong supporter of climbing in Norton is Brad Mathisen, who is working with forest service staff in the Jefferson National Forest to carefully develop both rope climbing and bouldering routes in the Guest River Gorge. Mathisen, who grew up in Pennsylvania and Ohio, now calls Southwest Virginia home and has been a climber for about ten years. 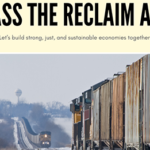 In addition to potentially bringing economic opportunities to the region, he sees climbing as a way to change opinions about how the region’s natural resources are used. When developing climbing in any area, securing access to the boulders can require a delicate dance between climbers, landowners and federal and state agencies. 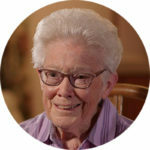 But perhaps nowhere in Appalachia has access defined the character of a climbing community as much as in Boone, N.C.
During the 1990s, climbers lost access to some of that area’s most popular climbing spots, either when they were put off limits out of environmental concern or when they were destroyed by bulldozers to make room for residential developments. According to Parlier, this history has left its mark on the local climbing community, which continues to be fiercely protective of the areas where they can climb. 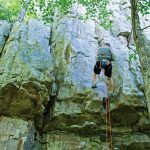 He believes that no guidebook exists for the Boone area out of concern that an influx of visitors could damage the climbing areas and result in more lost access. With more maintained trails, adequate parking to accommodate the larger numbers, and additional rangers and staff to help manage the public lands, the situation may eventually change. But for climbers serious enough to explore the available climbing through word-of-mouth and personal networks, the area has a lot to offer. Davis is not alone in finding pleasure in the challenge of the rocks. 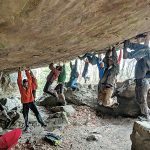 Climbers come to Appalachia from around the country, and around the world, to explore the highlands one boulder at a time.